The recent battle between WBO Welterweight world champion Jessie Vargas and future Hall of Famer Manny Pacquiao was in some ways treated as an afterthought by some Boxing fans. This was partly due to some feeling that the champion Vargas was a significant underdog, despite winning his world championship in his last fight prior to the encounter with Pacquiao in scoring a ninth round stoppage over previously undefeated contender Sadam Ali in March of this year. Pacquiao meanwhile came into the fight off of a recent retirement following his second victory in his trilogy with two-division world champion Timothy Bradley this past April. Following that fight, Pacquiao was elected as a senator in his native Philippines. Although Pacquiao, a former eight- division world champion has more than secured his place in any Hall of Fame associated with the sport of Boxing, his decision to return to the ring following his retirement was not surprising. After all, when the name Manny Pacquiao is mentioned it is hard not to associate him with some of the biggest events in the sport over the last decade. Even though Pacquiao has been through his share of wars throughout his career, it was understandable that he wanted to continue his career as a fighter perhaps feeling that he had more to accomplish. The question that this observer had in mind when the two fighters squared off on November 5th at the Thomas & Mack Center in Las Vegas, NV was whether the champion Vargas would be able to turn this encounter into a fight and surprise skeptics who treated the encounter between the two as an afterthought or a would be “Tune Up” for Pacquiao. It was also understandable how one might wonder whether Pacquiao’s political commitments outside the ring would impact his performance against a champion, who was hungry for respect. As has been the case in some of Pacquiao’s recent fights, the bout with Vargas was a very tactical battle where both fighters were able to have their moments. One of Pacquiao’s moments of the fight came in the second round when he was able to score a knockdown of the champion with a left hand. Although the knockdown of Vargas was in reality a flash knockdown, the speed difference between the two was apparent as Pacquiao consistently found ways to get his punches off first and dictating how the fight was fought for much of the bout. Even though Vargas did manage to have a couple of good rounds throughout the fight and was very “Game”, he was unable to land anything to turn the fight in his favor as Pacquiao would ultimately earn a lopsided twelve round unanimous decision to become WBO Welterweight world champion for a third time. Although Vargas ended up having a bad night against Pacquiao, it is important to remember that Vargas was going up against a great fighter and the loss will probably not negatively impact his career going forward. As for Pacquiao, he was able to regain his standing atop the Welterweight division and looked good coming off of a brief retirement. Sometimes it is a simple as one fighter besting the other and that was the story of this fight. An interesting story that could be developing however, might be the resumption of discussion among Boxing fans and experts alike of a potential rematch between Pacquiao and Floyd Mayweather. This has also been fueled by Mayweather’s attending Pacquiao’s fight against Vargas. Although it is indisputable that Floyd Mayweather and Manny Pacquiao have arguably been the two biggest draws in the sport over the last decade, it will be interesting to see how the public will respond to a rematch if it is indeed signed. When the two met in May of last year the pay-per-view event which was priced at $100 broke all existing pay-per-view and live gate attendance records. The actual fight however, failed to live up to the anticipation that preceded what was a legitimate “Super Fight” and left many fans feeling disappointed. This observer has doubts as to whether or not Boxing fans will be as willing to pay such a high price for the rematch given how the first fight between Mayweather and Pacquiao was fought. A rematch between the two will definitely draw significant attention if it is indeed signed, but given the general decline of pay-per-view buys for Boxing events in recent years as well as how both Mayweather and Pacquiao drew on pay-per-view in separate fights following their encounter last year, the question of whether Boxing fans would pay as high a price for a rematch between the two is a fair one to ask. Although there is no word as of this writing as to whether or not a rematch between the two will take place or how well Pacquiao’s fight with Jessie Vargas did in terms of pay-per-view buys, this observer believes if it makes sense from a financial standpoint and both fighters want to do it, make the fight. The official weigh-in for Saturday’s WBO World Welterweight championship fight between champion Jessie Vargas and future Hall of Famer Manny Pacquiao took place on Friday in Las Vegas, NV. The weights for the entire card are as follows. Main Event: WBO Welterweight world championship – 12Rds. Jessie Vargas (Champion) 146 1/2lbs. vs. Manny Pacquiao 144 3/4lbs. 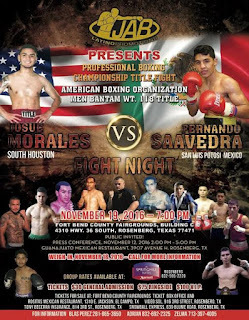 WBO Jr. Featherweight world championship – 12Rds. Nonito Donaire (Champion) 121 3/4lbs. vs. Jessie Magdaleno 121 3/4lbs. WBO Featherweight world championship – 12Rds. Oscar Valdez (Champion) 125 1/4lbs. vs. Hiroshige Osawa 125 1/4lbs. 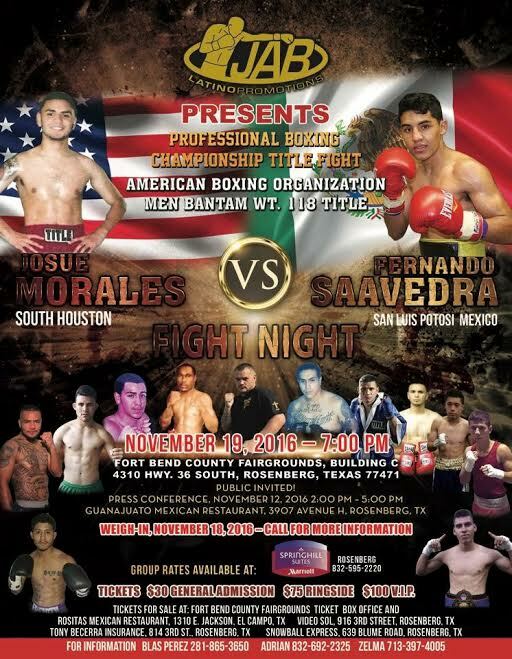 Vacant WBO Flyweight world championship – 12Rds. Zou Shiming 111lbs. vs. Prasitsak Phaprom 111 1/4lbs. Azael Cosio 150lbs. vs. Alexander Besputin 149 3/4lbs. Teofimo Lopez 133lbs. vs. Ishwar Siqueiros 133 3/4lbs. Fernando Fuentes 124 1/2lbs. vs. Que Xu 125 1/2lbs. Clay Burns 129lbs. vs. Robinson Conceicao 129 1/2lbs. Vargas vs. Pacquiao takes place Tonight (Saturday, November 5th) at the Thomas & Mack Center in Las Vegas, NV. The card can be seen on cable/satellite pay-per-view in the United States and Canada beginning at 9PM ET/6PMPT for $69.95.Check your cable or satellite provider for ordering information. The card can also be seen online at: www.toprank.tv for $59.95. In the United Kingdom and Ireland, the card can be seen on BoxNation at 1AM (Sunday, November 6th Local UK Time.) For more information please visit: www.boxnation.com. Check your listings internationally. For more information on Vargas vs. Pacquiao please visit: www.toprank.com. After a period of time that was referred to affectionately by some, including this observer as “Darktober” for the sport due to the significant absence of Boxing on television in the United States in the month of October; a period of time that was highlighted by the Chicago Cubs emerging victorious in the 2016 World Series, Boxing now prepares to return to center stage in November highlighted by two significant marquee pay-per-view cards. The first of the two events will take place on Saturday night at the Thomas & Mack Center in Las Vegas, NV as WBO Welterweight world champion Jessie Vargas makes the first defense of his championship against future Hall of Famer Manny Pacquiao. Pacquiao, who retired in April of this year after his second victory in his trilogy with former two-division world champion Timothy Bradley, now prepares to return to the ring following his victory in the political arena in becoming a senator in his native Philippines in May. Pacquiao will attempt to become a three-time Welterweight world champion when he faces the newly crowned WBO world champion Jessie Vargas. Vargas, who won the vacant WBO world championship in March of this year with an eighth round knockout over previously undefeated contender Sadam Ali has only lost one of twenty-eight career bouts with the lone loss coming against Timothy Bradley in June of last year. What appears to be an interesting fight on paper has in some ways been overshadowed by an element regarding the business of the sport as this will be the first time in several years that a pay-per-view Boxing card headlined by Manny Pacquiao will not have the involvement of two of Boxing’s major networks in the United States HBO and Showtime. Instead, promoter Bob Arum and his promotional company Top Rank Boxing will independently produce and distribute the pay-per-view broadcast. This is an interesting move as Manny Pacquiao has been a mainstay on HBO and it’s pay-per-view brand HBO Pay-Per-View for several years. The move comes as HBO declined produce and distribute the broadcast on pay-per-view due to the Vargas-Pacquiao card being too close to the scheduled November 19th pay-per-view card headlined by the World Light-Heavyweight championship fight between undefeated unified world champion Sergey Kovalev and undefeated Super-Middleweight world champion Andre Ward, a pay-per-view event that will be broadcast by HBO Pay-Per-View. 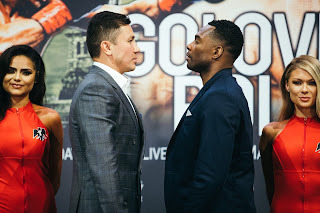 Although it is understandable how one might want to discuss the circumstances and reasoning behind Top Rank’s decision to produce an independent pay-per-view, it is important to remember that it is a move that is not unprecedented. Some may remember a time where the concept of promoters producing and distributing pay-per-view events, known as “Independent” productions due to the non-involvement of a television network was once commonplace in the sport. Throughout the 1980’s and 1990’s, promoters like Bob Arum’s Top Rank Boxing and Don King’s Don King Productions to name a few did produce and distribute their own pay-per-view events from time to time. There have been occasions where separate pay-per-view Boxing cards have taken place on the same day and even one occasion where two cards went head to head on pay-per-view. Some readers might remember the night of June 10, 2006 where Bob Arum’s Top Rank produced and distributed a pay-per-view card headlined by then Jr. Welterweight world champion Miguel Cotto’s title defense against Paul Malignaggi at New York’s Madison Square Garden while at the same time a separate pay-per-view card took place headlined by Antonio Tarver’s IBO World Light-Heavyweight championship defense against Bernard Hopkins at Boardwalk Hall in Atlantic City, NJ that was produced and distributed by HBO Pay-Per-View. Although the night of June 10, 2006 remains the only time to this observer’s knowledge that two separate events went head to head on cable/satellite pay-per-view, the decision to go the independent route for Vargas-Pacquiao should not be viewed as a surprising one by Top Rank. What is interesting however, with regard to two pay-per-view cards taking place within the same calendar month is whether or not the steady rise in the pricing for pay-per-view events in recent years will have a negative impact on either Top Rank’s Vargas-Pacquiao card or the HBO produced and distributed Kovaelv-Ward card. It is a fair question to ask and wonder given that both events are likely to be priced at around $70 each. Of course, both events will more than just the main event bouts, but it is important to remember that in addition to what could be viewed by some as expensive pay-per-view prices, both events will have to contend with an issue that could impact the overall pay-per-view numbers. The issue of the growing trend of consumers that have “Cut The Cord” and done away with the cable/satellite medium to consume their television choices in favor of Over The Top (OTT) digital distribution options and thus will not have access to the cable/satellite medium to order the broadcast of either card. Some readers may recall the column this observer published here on the website in December of last year titled “Is It Time For “Big Time” Boxing To Go Over The Top?” that discussed the general decline of Boxing pay-per-view buys in recent years and the rise of OTT digital distribution as a form of television consumption. This observer stated that it was and remains my opinion nearly a year later that consumers who have “Cut The Cord” by canceling their cable/satellite pay-TV services in favor of OTT television would welcome the opportunity to see a marquee Boxing event that would otherwise only be offered via cable/satellite pay-per-view if offered on an OTT basis. I closed that column by stating that even though seeing Boxing’s next “Big” or “Super” fight offered on an OTT basis may appear to be wishful thinking in the eyes of some, as the trend of “Cord-Cutting” continues to grow one can only imagine the potential audience that Boxing’s next marquee event could be missing out on. Although neither Vargas-Pacquiao or Kovalev-Ward will be offered on an OTT basis, this observer believes it would have been interesting to see either Top Rank or HBO test the waters of OTT digital distribution as a way to potentially gain more viewers than would normally be the case by offering the events strictly via the cable/satellite pay-per-view medium. It will nevertheless be interesting to see how the two upcoming pay-per-view cards compare with each other in regard to overall pay-per-view buys. Both cards have appeal, both have interesting main events, and the fighters involved do have dedicated fan followings. Although it is not out of the realm of possibility that some may choose to order both events, one may wonder if the ultimate authority, the Boxing fan will be forced to choose one event over the other or may ultimately decide not to order either event. Which Boxing event will you the reader choose to buy? In this observer’s eyes the question of who will win the two main event bouts that will headline these events is as interesting as the question of which event will generate more pay-per-view revenue. If nothing else, the answer to the second question just might determine whether dueling marquee pay-per-view Boxing events taking place within the same month will be a one-off or something that could become a new trend in the sport.